We are fast approaching the 8th annual Small Business Saturday on November 24th. The first-ever Small Business Saturday took place on Nov 27th, 2010, encouraging people across the country to support small, local businesses. The following year, the U.S. Senate unanimously passed a resolution of support for Small Business Saturday. Since then, Small Business Saturday has been championed by corporations, payment companies, and shoppers supporting their neighborhood businesses. In 2017, 108 million people went out to shop on Small Business Saturday, spending $12.9 billion at independently owned businesses. 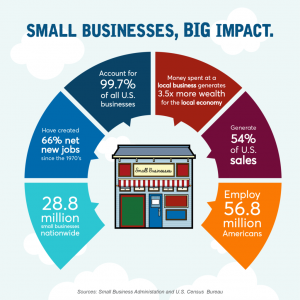 Why Is Small Business Saturday So Important? Helps stimulate the local economy. Money spent in the community creates new jobs. Local money stays local. When a customer spends a $100 in a small business, $68 of it stays in the community compared to $43 spent at national and franchise businesses. Independent businesses give back to the community. A small business is more likely to support local causes. Shopping at one local business helps other local businesses. Many independent retailers purchase their merchandisers from local vendors and causes a ripple effect. Keeps taxes local, and goes towards public services, better schools, and libraries. Diversifies the neighborhood, and creates unique offerings that are not found at major retailers. Bluefin offers a complete suite of security products for today’s omni-channel SMB, including mobile, retail, unattended and call center solutions backed by our PCI-validated Point-to-Point Encryption (P2PE) solution, and secure Ecommerce technologies including payment iFrame – helping to protect all store and online transactions this holiday season. Follow @shopsmall on Instagram to keep up with all the latest #ShopSmall news and events.